This week is a special week. We are 3 years old this week! So, Happy Birthday to us!! Our challenge this week is 'Celebration'. So, any project fitting this subject will be eligible for a prize. Add your name to Inlinkz on the DT and GDT blogs to be in with winning a prize on their blogs. Complete the blog hop (adding your name to Inlinkz on your way), collect all letters and form the sentence it forms and leave a comment at the end of our challenge post with your answer. We have a lot of sponsors this week, with lost of prizes to be won. A prize for the winner of our 'Celebration' challenge this week. A prize for the randomly chosen winner on each (G)DT member's blog. A prize for the randomly chosen comment with the correctly formed sentence from the collected letters along the way. To ensure all is done fairly, we will enable comment moderation this week to keep all answers behind, so there can be no cheating. As you can see you should have received here from Nikki's blog. 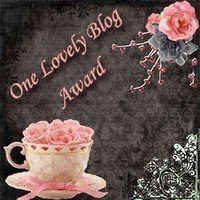 If you have not, please return there or to Elke's blog for the start of our blog hop. So, now it is time to get you some inspiration for this challenge. Here is my card for this challenge. 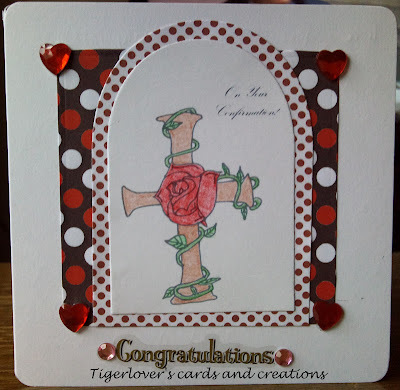 It is one I made for my friend who is doing her Confirmation this week, the stamp is by my mum Trimgym. Your next stop will be Liam and Owen. 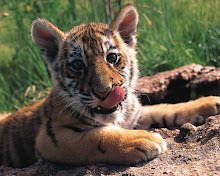 Hope you are having fun! Enjoy the rest of our blog hop! Labels: Confirmation, CRAFT Challenge Blog, CRAFT Challenge Bloghop, Digital Delights, Trimgym's Digistamps and Images. Polka dots and hearts, A girl after my own heart! The pop of red is a great idea! 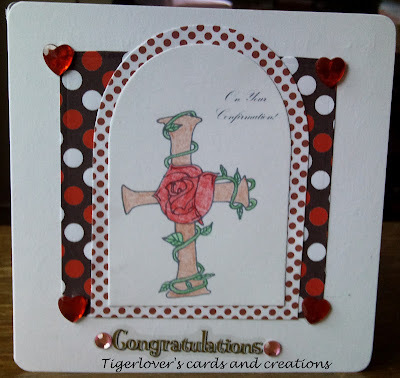 Hi Tiger lover, this is a brilliant card for your friend's confirmation. Beautiful card! That is an absolutely stunning rose and I really like how you allowed the image to take center stage. Great card! The blings on the corners look so great! 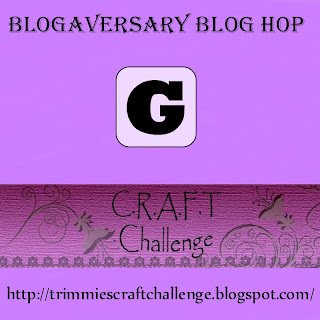 Happy 3rd Blogaversary! your card is gorgeous! I love the image and the gorgeous papers and heart gems. It's a fab design! Just love your religious themed card! Thanks for the hop and Happy 3rd Birthday. So nice to see a religious themed card. So pretty. Happy 3rd birthday CRAFT. 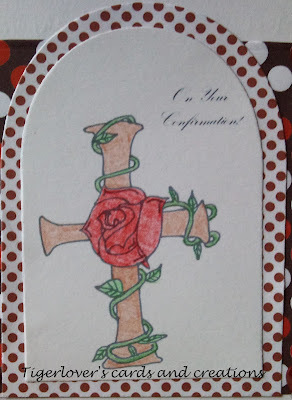 Lovely card, perfect for a Confirmation. G is for Great job!